The item Harley Quinn : Rebirth deluxe edition, Issue 14-27, Jimmy Palmiotti, Amanda Conner [and four others] writers ; John Timms [and ten others], artists, (electronic resource) represents a specific, individual, material embodiment of a distinct intellectual or artistic creation found in Kent District Library. If you thought breaking up with the Joker meant things would calm down for comics' most adorable antihero ¿ well, you ain't met Harley! It's all-out nuttiness as Harley takes on the corrupt mayor of New York, a time-traveling assassin and her second-deadliest admirer, Harley Sinn, but the Mistress of Mayhem has it handled ¿ at least until her parents show up! Mr. and Mrs. Quinzel are in town for their li'l monster's birthday, but is Harley ready for them to meet her crew, including gal-pal Poison Ivy and unstable mercenary Red Tool? By the time the folks' own skeletons finally come bursting out of their closet, Harley's birthday wish may be that she had just stayed in bed! 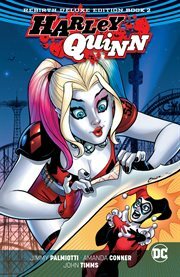 The unhinged adventures of Harley Quinn take a turn for the even weirder in Harley Quinn Rebirth Deluxe Edition Book 2, a collection of the smash-hit action-comedy series from writers Amanda Conner and Jimmy Palmiotti and artist John Timms, with backup stories by Palmiotti, Paul Dini and Bret Blevins. Also collects the Harley Quinn 25th Anniversary Special!